Overview - The 1992 presidential election was a triumph not only for Bill Clinton but also for the new breed of strategists who guided him to the White House and changed the face of politics in the process. For this thrilling, behind-closed-doors account of that campaign, renowned cinema verité filmmakers D. A. Pennebaker and Chris Hegedus closely followed the brainstorming and bull sessions of Clinton’s crack team of consultants—especially the folksy James Carville and the preppy George Stephanopoulos, who became media stars in their own right as they injected a youthful spirit and spontaneity into the process of campaigning. Fleet-footed and entertaining, The War Room is a vivid document of a political moment whose truths (“It’s the economy, stupid!”) still ring in our ears. At times it can seem like the political game is nothing more than an ever evolving rat-race of manipulation, obsession, distortion, endless rhetoric and repeated bullet points -- and while my feelings about the increasingly elaborate campaign process are not exactly positive, there is no denying that there is a certain kind of brilliance behind its strategy. A brilliance fueled by spin, quick rebuttals, carefully worded slogans, meticulously edited TV spots, perfectly timed leaks, and even a little bit of truth here and there. 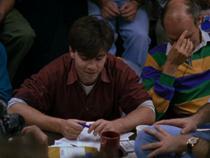 In the 1993 documentary, 'The War Room,' we are given a backstage pass to witness such brilliance. Thrust into the very eye of the campaign storm, directors Chris Hegedus and D.A. Pennebaker take audiences right into the thick of the 1992 Clinton campaign, coming away with an occasionally fascinating, entertaining and historically important document of political strategy that continues to be just as relevant today as it was twenty years ago. The documentary follows the influential 1992 Clinton Presidential campaign, focusing on the various strategy meetings held in the "war room" where Clinton's advisers and consultants gathered to spin damage control and brainstorm ideas. The narrative weaves through the major bullet points of the race, touching upon scandals, debates, voting results and various attempts to make the opposition look bad. All the while, the focus remains mostly insular, centering on the war room itself and how its crack team of political minds deals with the shifting tides. Chief strategist James Carville and communications director George Stephanopoulos end up taking the spotlight, serving as the documentary's primary leads and the audience's emotional core. Directors Chris Hegedus and D.A. Pennebaker make the most of the relatively limited access they were granted and employ a very cinema verite, fly-on-the-wall approach. Traditional voice over narration and talking head interviews are eschewed in favor of a handheld visceral approach that provides a seemingly intimate, stripped down feel. Lots of news broadcast footage is weaved into the narrative helping to flesh out key plot points while occasionally offering a look at the opposition's response, but for the most part, it’s the matter-of-fact meetings in the war room that make up the brunt of the material. While the film is home to a masterful display of editing, these brainstorming sessions often provide a refreshingly straightforward experience, letting the events themselves tell the story and form their own structure without relying on additional narration or sit down interviews. It takes a little while for the movie to completely find its groove, but once James Carville and George Stephanopoulos take center stage, things pick up considerably and both men really help to give the film focus and drive. Carville in particular is a real treat to watch, and the "Ragin' Cajun" absolutely explodes with personality. His fiery enthusiasm, wit and wild energy provide the film with its most entertaining moments while fueling most of its drama. Carville's intriguing romance with Bush campaign strategist Mary Matalin (his direct competition) is also touched upon, and one candid, voyeuristic shot of the two meeting up after a debate really demonstrates the complicated mixture of emotions they both had to keep hidden. Even more noteworthy than Carville's demeanor or forbidden romance, however, is the fact that (as a recent appearance on 'Real Time with Bill Maher' demonstrated) even twenty years later the man still owns the same colorful, striped shirt he wears in the movie. Though after seeing the powerful garment in all its glory, I must say it's easy to see why he's hung on to it. Some things simply never go out of fashion. Though equally passionate, Stephanopoulos is much more reserved, stabilizing the proceedings to a degree. That being said, the communications director ends up lending some youthful heart to the film. Some emotional conversations toward the end, after Clinton wins the election, are quite revealing, and really show just how much spirit Stephanopoulos and the rest of the team put into their work. The amount of stress and anxiety they go through is palpable and the payoff when they win presents an elated but still slightly sobering atmosphere of relief. The way Carville and Stephanopoulos bounce off each other and the rest of the room's various consultants creates a perfect storm of political strategy. Though very different, each team member brings something to the table and together they are ready to respond to just about any crisis. The numerous topics mulled around in the war room range from the sensational (the Gennifer Flowers scandal opens the picture) to the oddly mundane (one argument involves the specific type of signage that is going to be used at a rally). In fact, one of the film's most dramatic beats follows an attempt to leak a story that involves the Bush camp's alleged printing of campaign materials in Brazil. If that doesn't exactly sound like the most stimulating turn of events, you're not alone, and indeed there are times where one is left wondering what the big deal is and why the strategists are obsessing over every specific adjective and verb. Of course, it's this almost absurd level of attention to detail that makes the whole process so fascinating to watch and it becomes clear that every leak and every word truly matters, revealing the grand genius of Carville and his team's obsessive methods. The intricacies of the political machine are on full display, illuminating all of its complicated, bizarre, silly, frustrating, and absolutely absorbing madness. As someone who has been watching his fair share of Republican primary coverage, 'The War Room' can't help but bring to mind that old proverb, "The more things change, the more they stay the same." While the internet and Super PACS have forever altered the landscape of the campaigning world, the core strategies still remain constant and it's quite interesting to watch the very same tactics, tricks, issues, and blind rhetoric come into play now just as they did twenty years ago. Criterion could not have picked a more appropriate time to release this disc and the film's insights remain just as timely as they did in 1993. By embracing their limited access, the filmmakers provide a honed in, focused experience that fully details the Clinton campaign's war room strategies. While a lot of the larger issues of the race are skimmed over, and President Clinton himself is only captured in archive material and a few fleeting glimpses, the intimate story that Hegedus and Pennebaker find through Carville and Stephanopoulos is much more interesting than any over-bloated, all encompassing documentary could ever hope to be. 'The War Room' pulls back the curtain on political strategy, showcasing the obsessive, often absurd minutia of campaigning. Right in the thick of a brand new presidential race, the documentary remains as insightful as ever. Viewer's specific political affiliation should have no bearing on their potential enjoyment here, as the film isn't about left or right, it's about the process as a whole -- and what a strange, bewildering, exasperating and utterly thought provoking process it is. Criterion presents 'The War Room' in their standard clear case with spine number 602. The BD-50 region A disc comes packaged with a booklet featuring an essay by writer Louis Menand. The movie is provided with a 1080p/AVC MPEG-4 transfer in the 1.33:1 aspect ratio. Like many documentaries, the film features a lot of archive material taken from different sources, leading to a fairly uneven but authentic video presentation. A good chunk of the footage is taken from 16mm material shot specifically for the movie. These sequences look pretty good, offering nice detail and a moderate layer of fine grain. Some minor specks and hairs are visible, but damage is essentially negligible. Colors are natural and realistic with well balanced contrast and consistent black levels. Due to the fly-on-the-wall approach and the nature of the content itself (we're mostly treated to a bunch of offices and convention halls), the image is never exactly impressive, but the transfer is technically strong. Archive material culled from various standard definition sources (mainly news broadcasts) are weaved in periodically, and these sequences look about as good as one might expect -- which is to say, not so great. Several video artifacts are visible in these scenes including edge enhancement, but that is to be expected given the nature of the material. 'The War Room' looks exactly like it should on Blu-ray, and while the archive material makes for a decidedly uneven picture, that's simply the nature of documentaries of this type. Free of any major signs of damage or unnecessary processing, this is a very solid video presentation. The movie is presented with an English DTS-HD MA 2.0 surround track. Though clean and surprisingly lively at times (with the exception of the archive footage), some of the dialogue placement is a bit unnatural and surround effects can sound a little forced. Dialogue is mostly crisp and easy to understand throughout. With that said, some of the speech is oddly spaced around the room at times, occasionally hitting the left, right and even back speakers without any kind of directional motivation. Thankfully this doesn't prove to be an overly troublesome issue and most of the dialogue is correctly centralized. The entire soundstage has some pleasing separation (especially for a documentary) and surround use is actually decent with some isolated effects including background chatter, fireworks, and clicking cameras hitting the rears. Unfortunately, some of these choices can sound a little unnatural at times. Fidelity and dynamic range are solid in the 16mm material, but as expected, some of the archive footage features hissing and other technical anomalies. Given the dialogue intensive nature of the mix, bass activity is negligible. There are a few slightly strange issues concerning speech placement and surround activity which seem to stem from the matrixed nature of the 2.0 surround mixing, but 'The War Room' sounds good overall, offering a bit more immersion than your average documentary. Criterion has put together an excellent collection of special features including a feature length follow-up to the main film and an extensive interview with the filmmakers. All of the supplements are provided with Dolby Digital 2.0 or 1.0 tracks and no subtitle options. William J. Clinton Foundation Panel (HD, 26 min) - Excerpts from a 2011 retrospective panel on the 1992 Clinton campaign are included. Participants, including James Carville, reflect back on their strategies and confidence in their candidate. President Clinton himself takes the microphone for the majority of the running time and offers his own thoughts. Political junkies should find a lot to like here, but casual fans might be bored. Return of the War Room (HD, 1hr and 22 min) - Presented in 1080i this is a feature length follow-up to the film from the same creative team that was produced in 2008. 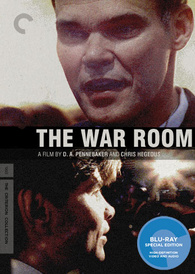 Featuring retrospective interviews with many of the participants from 'The War Room' (including Carville and Stephanopoulos) the doc offers a candid look back at the legendary campaign. Many of the major beats from the original film are covered and elaborated on and more focus is placed on the fascinating relationship between Carville and his Republican wife Mary Matalin. The internet's lasting effects on the world of campaign strategy and politics are also addressed, and after listening to him talk in this doc, I think I may actually dislike pollster Frank Luntz a little less (though I still hate his stupid dials). Though it lacks the artistry and intensity of the main feature, this follow-up is still informative and well crafted, serving as a more traditional talking head counterpoint to the original film. Making the War Room (HD) - Several recently conducted interviews with the filmmakers are included in 1080p. Directors Chris Hegedus & D.A. Pennebaker sit down with producers Wendy Ettinger & R.J. Cutler (41 min) for an informal and extensive conversation about the making of the film. The participants discuss the genesis of the idea, the various difficulties they ran into in order to get the limited access they received, and the excitement they felt when they realized that James Carville could carry the picture. Additional interviews with producer Frazer Pennebaker (9 min) and camera operator Nick Doob (6 min) are also included offering more details on the film's production, release, and what it was like to work with Stephanopoulos and gain his trust. Filled with tons of interesting information and anecdotes, these interviews are well worth a look. Stanley Greenberg (HD, 11 min) - Presented in 1080p this is an interview with pollster Stanley Greenberg who worked on the 1992 Clinton campaign. Greenberg discusses his job and the intricacies of the polling process. Trailer (HD, 2 min) - The trailer for the film is presented in 1080p. 'The War Room' offers an intimate, focused peek into the complicated and sometimes bizarre machinations of campaign strategy. With their visceral, fly-on-the-wall approach the filmmakers are able to let the events mostly speak for themselves, and James Carville's larger than life personality adds some welcomed entertainment value. With its mixture of 16mm footage and archive news broadcast material, the video transfer is a little uneven but still solid. The 2.0 surround mix adds a welcomed amount of immersion to the proceedings but does suffer from a few odd, though relatively small issues. Criterion has done a great job with the special features, offering a strong assortment of supplements including an additional feature length follow-up and lots of interview material. Documentary fans, and those with even a cursory interest in the strategy of politics should definitely check this out. Recommended.